Working with young artists keeps George Clinton going. The past 12 months have been tragic for Parliament Funkadelic. The grandmasters of funk have seen two members of their collective fall. Last June, keyboardist extraordinaire Bernie Worrell died of cancer, and just this past January, their former musical director, Junie Morrison, passed away. But those expecting the group's show March 5 at the Fillmore to be a funereal experience will be sorely disappointed. Just as it has been doing for the past five decades, Parliament Funkadelic in all of its many iterations has been a traveling extravaganza of joy — one part Mardi Gras, one part superhero comic book come to life, and all playful funk. 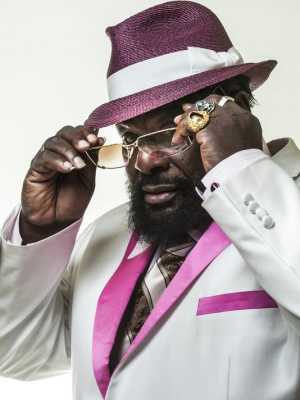 The band's leader, George Clinton, has traveled up and down the annals of popular music history. Clinton started the Parliaments as a doo-wop group. After learning a few tricks from a job as a staff songwriter at Motown, Clinton began to funkify Parliament's sound. Classic 1970s albums such as Mothership Connection and Maggot Brain fused rock, jazz, and soul influences that didn't exactly invent the nasty genre of music we've come to know as funk, but they certainly came to define it. The group's influence stretched across all corners of the music industry. Clinton produced the Red Hot Chili Peppers' early albums. Bassist Bootsy Collins showed up in Deee-Lite's "Groove Is in the Heart," and Worrell collaborated with the Talking Heads. But the band's imprint is most noticeable in hip-hop. Pretty much every notable act from the '80s and '90s to today has sampled at least one track from the P-Funk catalog. Public Enemy, De La Soul, N.W.A., A Tribe Called Quest, and even Earl Sweatshirt and Childish Gambino all found irresistible beats to complement their lyrics. Clinton and most members of Parliament Funkadelic's classic lineup are now in their '70s, but they see no need to slow down. They still put on live shows stretching longer than three hours. They tour extensively and this spring plan to put out a new album with contributions from Sly Stone, Fred Wesley, Pee Wee Ellis, and some of Morrison's last work before he left this frequency. Clinton said in a recent Rolling Stone interview that working with new artists such as Kendrick Lamar and Thundercat keeps him going. "I'm blessed to still be here, but it is their day — no matter what you think about what they're doing," he said of today's young artists. "Once you realize that, you realize that what they're doing is the same as what we were doing when we first started. They're breaking rules and getting on your nerves 'cause they're moving you out. Regardless of how adolescent you think it is — that's what it's supposed to be."